I have one heck of a flavor explosion for you today – my favorite Mediterranean kale salad! It’s ANOTHER recipe I’ve been making at home that is totally inspired by Panera. I know! It’s like I’m living ten years ago with all of these Panera salads. But this one is just soooo wonderful. I actually find myself craving it. There is crunch and flavor and texture and it doesn’t make me feel like I’m eating a sad lunch salad. Plus, it makes me feel GOOD. Lots of great stuff in here for us. Back in the fall, we started ordering the modern greek quinoa salad at Panera. I somehow realized (or someone told me?!) that you could add smoked pulled chicken to the salad and it was the best day ever. Made the salad about 150 times better. As a side bar, any time I get a salad at Panera now, I order the smoked pulled chicken. Try it! You won’t regret it. For this Mediterranean kale salad, I became a total cheater and used a rotisserie chicken. I love the ones from Whole Foods and they make dinner so easy in a pinch. It’s not smoked, but we do have a smoker and I’m not opposed to smoking chicken for said salad. They are a quick meat to smoke anyway, so it may be in the cards soon. The kicker is that I love shredded chicken in a salad! If you’re short on time, rotisserie is the way to go. The Panera version of this salad has a tomato sofrito blend, but I couldn’t exactly figure that out. It seems like a sticky mixture of tomatoes and quinoa, albeit still delicious. And the sofrito just didn’t seem to… mesh… with the Mediterranean salad flavors I was going for. So my solution was to make a batch of quinoa and throw it in. It’s simple, but it adds a lot to the salad in terms of texture and satiety. And the quinoa does double duty. I suggest making a batch and using the leftovers for things like breakfast quinoa and burrito bowls. It’s ready to go! The comes all the flavor. In addition to the chicken and quinoa, we have cherry tomatoes. Roasted red peppers. Kalamata olives. Sliced cucumber. Finally, tons of feta. But! My favorite part of this salad is nothing spectacular. It’s those crunchy sliced almonds. They are something I’d never think to put on this salad combination myself. And of course, I used the honey roasted ones which make it even better. So much crunch. Not to mention deliciousness. Pretty sure this has everything I want in each bite. 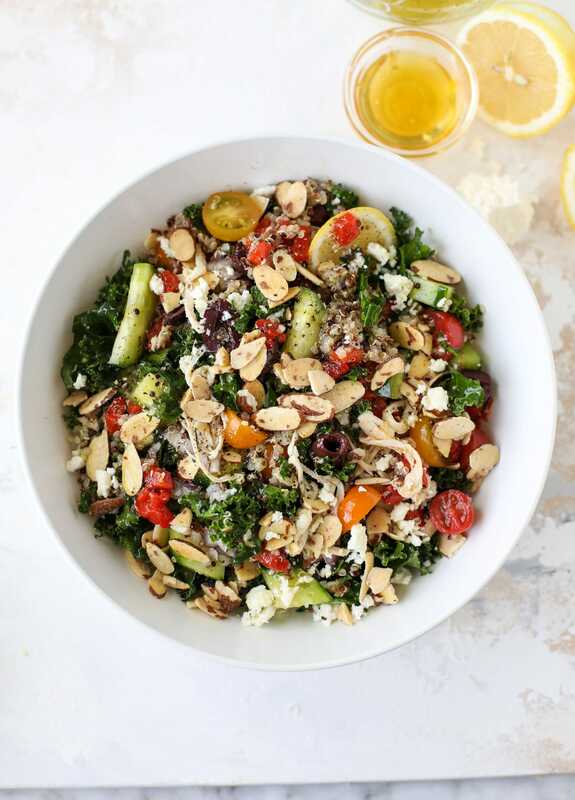 This Mediterranean kale and quinoa salad is a copycat for the delicious Panera Bread Modern Greek Salad with Chicken. Super easy and satisfying! If needed, cook your quinoa according to package directions. It should on take 15 minutes! Place the kale in a bowl and massage the leaves with 1 teaspoon of olive oil. Set it aside for 10 minutes. I usually chop up the vegetables while I want! After 1 minutes, season it with salt and pepper and toss once more. To assemble the salad, add the chicken and quinoa into the bowl of the kale and toss again. Add on the tomatoes, peppers, cucumber, olives, almonds, feta and shallot. Drizzle on some of the dressing and toss. Serve with additional dressing and a lemon wedge. In a bowl, whisk together the vinegar, lemon juice, honey, garlic, dill, oregano, salt and pepper. Continue to whisk while streaming in the olive oil. This dressing stays great in the fridge in a sealed container for a week or so, so feel free to make a double batch if desired! All text and images ©How Sweet Eats. Even though it’s NEGATIVE 1°F here today, this cooling salad still looks appetizing. Crave-worthy, for sure. How much quinoa would you cook? Nothing was listed in the recipe. This looks amazing. sorry maryann! it’s 1/2 cup. :) thank you! I love this salad from Panera!! It’s the only thing I order there (no chicken tho cause I’m a vegetarian). I’ve always wanted to make it myself and now I have to! Love it! isn’t it so good?! so glad someone else loves it too! Oh my goodness, this looks like texture heaven! So excited to give it a try! Oh my goodness, this looks incredible! I’m in love with Mediterranean food! I’m excited to try it! When you have a minute, please check out my new YouTube channel called “Get Your Dish Together!”, is a (mostly) healthy cooking and food prep show! We will cover many recipes and tips to help you master the kitchen! My sister will also be joining me with her expertise on nutrition, fitness and overall wellness to help you become your best YOU! Don’t forget to subscribe! Delicious! The idea of smoked chicken on there even more so! You have a smoker 😁? I would love to see some smoker recipes on your site in the future! I, for one, could use some help in that area! You nailed it! This is one of my favorite salads at Panera and I made your recipe tonight — and it was a hit! Love the use of kale and all the other textures and tastes (and the almonds really add a great crunch). Yum! This is really delicious! I made this last night for the Super Bowl!! I will be making this salad over and over again!! In fact, I’m running to the store right now – in a Wyoming Winter Snow Storm – just to get some more curly leaf kale to make another big bowl to get me through the week!! Thanks SO much for a DELICIOUS and filling salad. I made this for dinner last night and it was SO good! Thank you for doing all of the hard work of telling me me how to make a good salad! I love ordering salads at restaurants because they always do everything right (flavor, texture, protein, veggies, etc), but am a complete dud when making them at home. This is such a keeper! Thank you! thank YOU!!! i’m so glad you liked it ashly! Omg! I made this for lunch yesterday and this was the best lunch I’ve had in SUCH a long time! And it’s a SALAD! Oh my gosh, I can’t wait to make this again! I used rotisserie chicken. I omitted the olives (not a fan) but otherwise kept true to the recipe! FIVE STAR!!! Absolutely yummy! A definite keeper. Instead of putting shredded chicken in the salad, I marinated and barbecued some chicken thighs. Very tasty. Lovely mix of flavours and textures, and the dressing pulled it all together. Five stars! I am currently so obsessed with this salad! So many flavors that blend so well together :) This is a must try. I recently had the Greek Salad at Panera Bread and automatically wondered how I could recreate it. Thank you for figuring it out for me!! !